Shannon Blue | Ahtna Inc Apr 2, 2019. Glennallen, Alaska – The Ahtna people are mourning the loss of beloved Elder, leader and first president of Ahtna, Incorporated – Mr. Robert Marshall. Mr. Marshall passed away Sunday, March 31, 2019, at Tazlina, Alaska. A well-known and respected Ahtna leader, Mr. Marshall served his people in various capacities throughout his life and was instrumental in the formation of Ahtna, Inc. and the Copper River Native Association (CRNA). To honor his contributions through the years, CRNA’s new building is named the Robert Marshall Building. Even his traditional name ‘Kensal canan’, which means “Leader Man comes back with a boat,” highlights his leadership qualities. 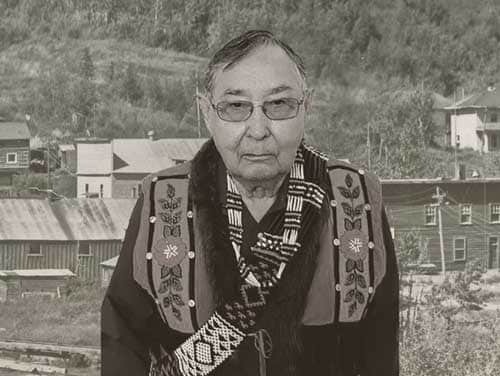 Mr. Marshall’s contributions to the Ahtna people lives on through the cultural and traditional knowledge he readily shared; he spoke of his wish that traditional Ahtna practices and protocol be followed correctly and passed on to the next generation. He frequently ended his speeches by recognizing the potential of the younger generations and encouraging them to step up and be leaders for the good of the Ahtna people. “Robert laid a solid foundation for Ahtna to thrive as a company and we are forever grateful for the strong leadership, traditional knowledge and guidance he gave over his lifetime,” said Ahtna, Inc. chair Ken Johns. Robert Marshall was born on April 13, 1922, in Chitina, Alaska, to parents Bob and Maude Marshall. A born leader, he shot his first moose at 8 and built his first fish wheel at 14. He lived with his wife Mae in Tazlina, where they raised four children and was a proud grandfather of many grandchildren and great-grandchildren. He served with the Alaska Federation of Natives (AFN), RurAL CAP, and the Native Village of Tazlina. He retired after 40 years of service to the Alaska Department of Transportation. In 2013, he was awarded the prestigious AFN Elder of the Year Award which exemplifies the highest of values and qualities important to Native people. Friday, April 5: Visitation at Glennallen Chapel at 2 pm. Dinner to follow at Kluti-Kaah Memorial Hall. Saturday, April 6: Funeral Services at Glennallen Chapel at 11 am. Interment to follow at family cemetery located at 14 mile in Kenny Lake. Dinner and Potlatch at Kluti-Kaah Memorial Hall.